Looks like the Honda CB1100R concept motorcycle won’t be put into production according to HelmetHairblog. 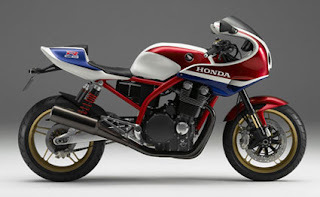 Though the Honda CB1100R looks so exquisite and gorgeous from all angles, according to the designer, Koji Miwa, this motorcycle will be very expensive to produce because of the quality of the parts. Though motorcycle enthusiasts who won’t mind spending outrageously huge amount of money on their motor bikes won’t mind, Miwa said that he wanted the Honda CB1100R to sell as a regular model and not a limited edition machine. So what makes the Honda CB1100R too expensive you say? Well, just the 1100cc engine. I don’t mind scrapping the 1100cc engine on the Honda CB1100R, I just really like the design on this machine and I hope that I would see this on the street soon. But I guess it’s just as well that Miwa wants the Honda CB1100R to be a regular bike coz imagine the Motorcycle Insurance premium you have to pay for a very expensive bike with 1100cc engine. Speaking of motorcycle insurance, my brother just got a brand new sports bike and I was surprised by the amount of premium that the dealer quoted for him. He said that the more sportier and expensive the motorcycle, the higher the premium you have to pay. But thanks to the internet, my brother was able to find a motorcycle insurance with a lesser premium, but of course that means limited coverage.